They had a dream. They had a target. They had a future. That is to enter in to the state universities. But their dreams have shattered. Their future is uncertain. 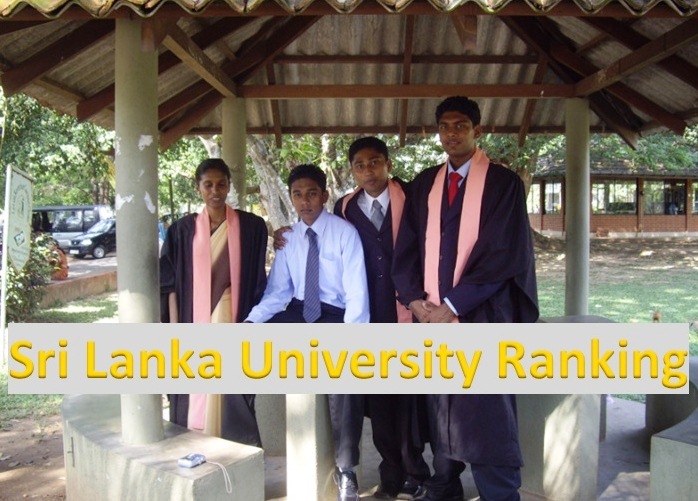 Entering in to the state university is the highest success that any student can achieve in Sri Lanka. 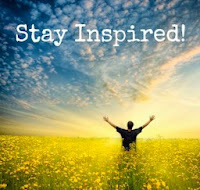 But today those who have achieved it have to give up the big dream due to wrong calculation of results of university entrance examination held last year. Since last week thousands of Sri Lankan students among with their parents are protesting against the Sri Lankan government’s education officials as they have mess-up the results. Thousands of students those who are qualified to enter universities earlier, found that their rankings had changed after the new rankings were released as ordered by Supreme Court. The release of the revised Z-score rankings triggered a public outcry in the country and even some political parties and unions demands for the Education Minister and Higher education Minister to resign. 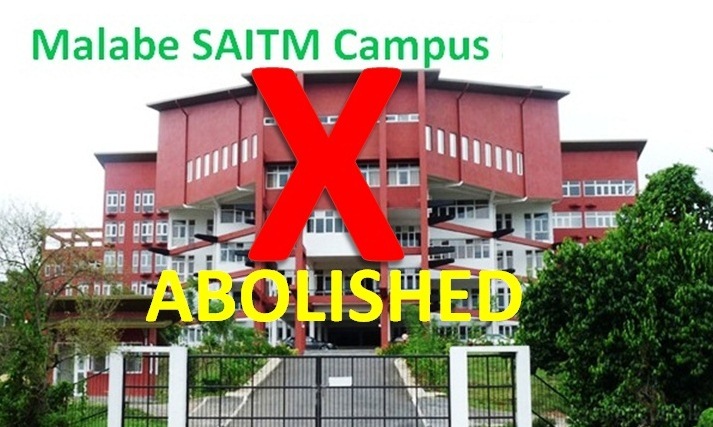 It is reported that the affected students were planning to take legal action again over this change in the Z-scores with another group of affected students having complained to the Human Rights Commission of Sri Lanka. The General Certificate of Education Advanced Level (GCE A/L) examination is the entrance qualification for Sri Lankan state universities. It is a General Certificate of Education (GCE) qualification in Sri Lanka. The exam is conducted each year on August. The students are allowed to sit for the exam 3 times only. 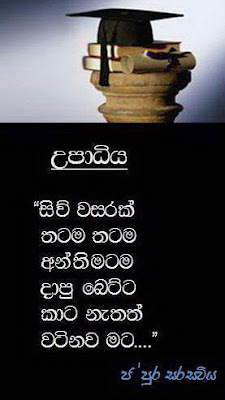 The exams are held in three mediums Sinhala, Tamil and English. The total number of 240,000 students had sat for GCE A/L examination in 2011 August under the old and new syllabus. 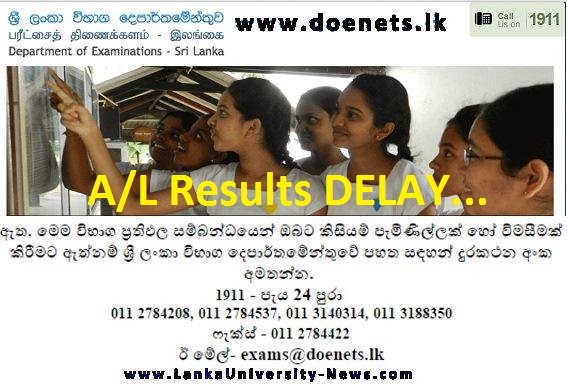 The results scheduled to be issued on November 2011 but the Education Ministry has stated that a month delay has occurred in the release of the results due to preparation of the “Z-scores” according to the old and new syllabuses. 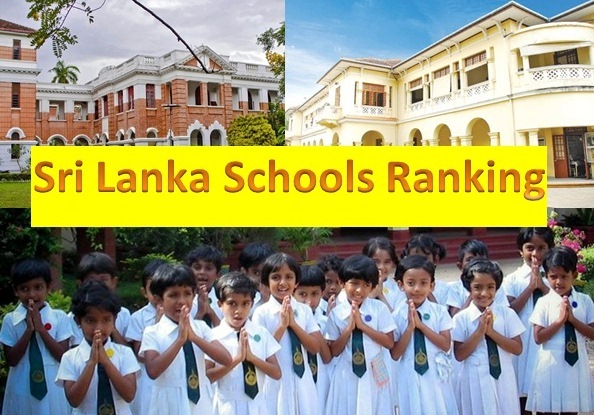 Sri Lanka's education system uses “Z-score” results a ranking method to determine the admissions to the country's universities from the highly competitive GCE A/L examination. 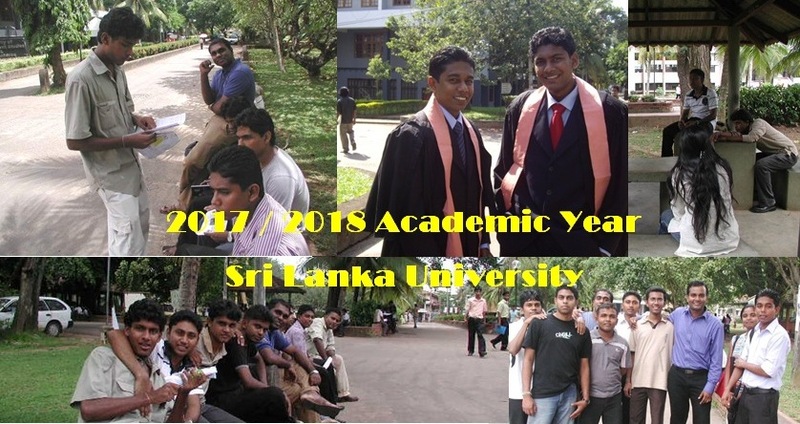 The GCE A/L exam in Sri Lanka is a very competitive exam and only 9% of the students who sit for the examinations are admitted to state universities. 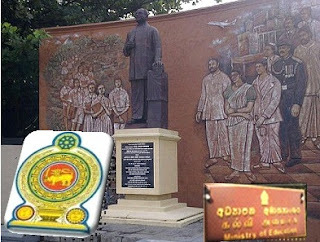 Sri Lanka University Grants Commission (UGC) successfully appealed to change the method of determining the cut-off scores for university admissions from raw scores to standardized z-scores in the year 2001. After repeated delays, On December 25th Education Ministry issued the results but found errors in the calculation of District and island ranks. However, within hours of the release, complaints started flooding in from all over the island regarding errors in the results obtained by candidates. Later island wide and district rankings have been cancelled by the officials and went onto say that was due to an error that occurred when compiling the rankings using computers. “While trying to release the results in a hurry certain computer errors had occurred. To remedy it the President appointed a separate commission to rectify them. What was revealed that while Data was fed into the computer certain errors had occurred” said Education Minister Bandula Gunawardene. Again the next day Ministry has issued revised district and island ranks but students found errors in their rankings. 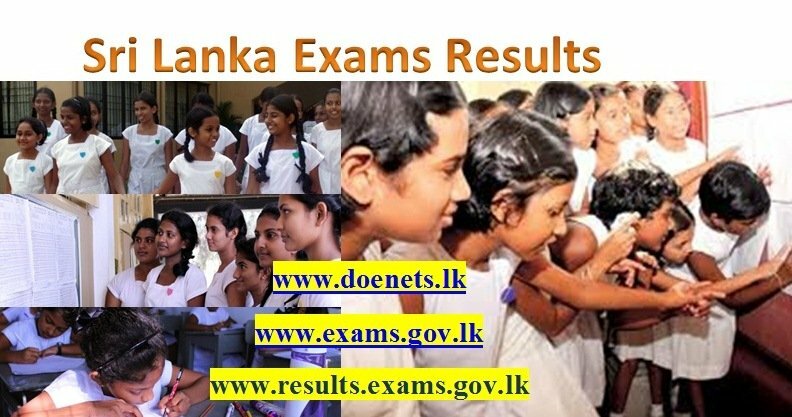 Sri Lanka's Department of Examination Commissioner has received 147,000 applications for re-correction of results of the 2011 A/L examination. Meanwhile a petition was filed by Ceylon Teachers' Union and the 16 students who sat for the A/Level exam in 2011 to cancel the entire results of the 2011 GCE A/L. On June 25, Supreme Court ordered to University Grants Commission (UGC) to cancel the current Z-score marks and re-calculate the score according to old and new syllabuses separately and re-issue. Court described it as a complex issue but determined that rights of students had been violated and directed the UGC to recalculate the marks of all candidates who sat the exam in 2011 using a revised and acceptable method. Earlier, the Z-scores were calculated based on the old and new syllabuses being a single entity. The Supreme Court directed the UGC to recalculate the Z-scores on the basis that the two syllabuses were different entities. 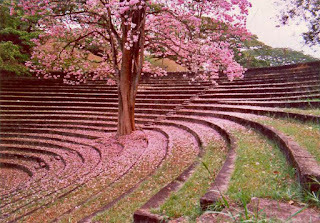 Sri Lanka higher education authorities have released the Z-scores for the 2011 GCE A/L Examination on July 25. Thousands of School students and their parents have joined with university students in a new wave of protests to hit Sri Lanka in recent weeks. 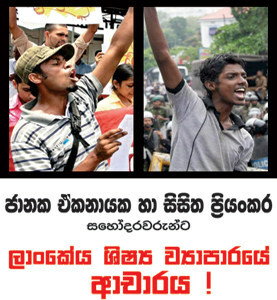 Notably, there have been protests in Colombo,Galle, Matara, Ratnapura and Kandy districts. Some students who had enough points to enter university under the canceled rankings system now find a reduction in their points after the revised Z-score results were released by education authorities last week following the Supreme Court order. The district and island rankings of students who sat the 2011 GCE A/L Examination under the old syllabus had dropped drastically after the new rankings were released. “I could have gone to the Law faculty, but after the new results, it’s only a dream. My district ranking has changed from 43 to 260.my relations gave me gifts after I have selected for the Law Faculty. 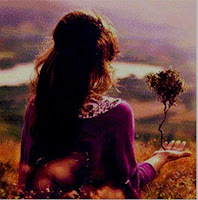 But now, how I tell them the truth”. Said Sanduni Ekanayake a girl from Mathugama. Our parents taught us facing lot of difficulties. Officials have shattered our future. After heard the second results, we had to admit my mother to the hospital. We don’t have money to go to private universities or foreign countries” said Arts stream student Harshani Madushika from Matara. 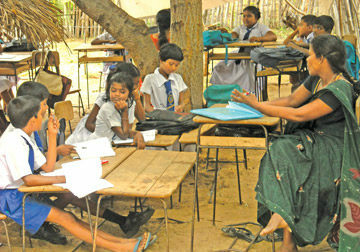 A depressed parent from Galle said she had great hopes for his son’s education. “Since childhood my son’s dream was to become an engineer. He sat the exam and result came. His dream was fulfilled and we are so happy. But after those re calculations, it has changed. Now his Z-score has changed from 1.9694 to 1.5364. He may not get selected to the engineering faculty,” mourned Piyaseeli a mother of a student. “My son sat the exam in the maths stream. We are now worried that he may not get selected to the engineering faculty,” Since results are out, my child is crying. We asked from government not to play with children’s lives “lamented Ariyawathi, mother of a student. “I sat the exam from the bio stream and obtained a Z-score of 2.0754. I was selected to do medicine. However, now the score came down to 1.9090 under the revised system. “Is this what we get after studying and working hard for 13 years? Eranda Ekanayake a student from Colombo questioned from officials. 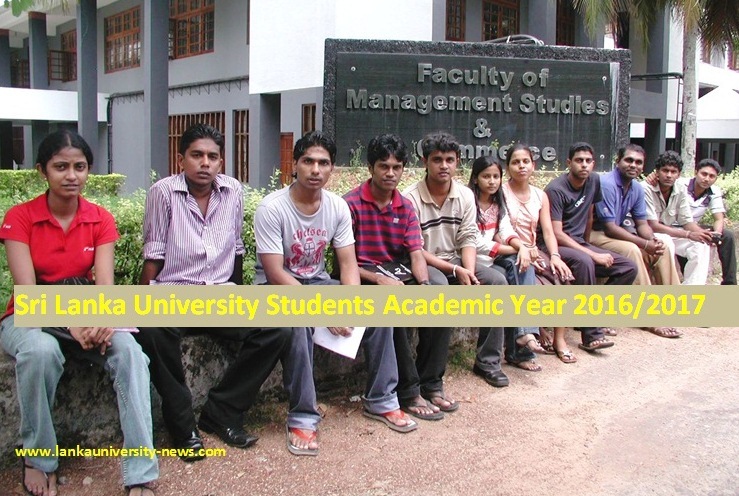 Inter University Students’ Federation (IUSF) Convener Sanjeewa Bandara told to UWN that “this blunder is a fine example for the negligence prevalent in the education sector. We reject these results entirely. Appointing a committee is simply an attempt to cheat the public again. A comprehensive review has to be conducted and have to take action to prevent such a situation from arising again. At the moment we are organizing protests around the country and hope to give more pressure till a solution granted”. 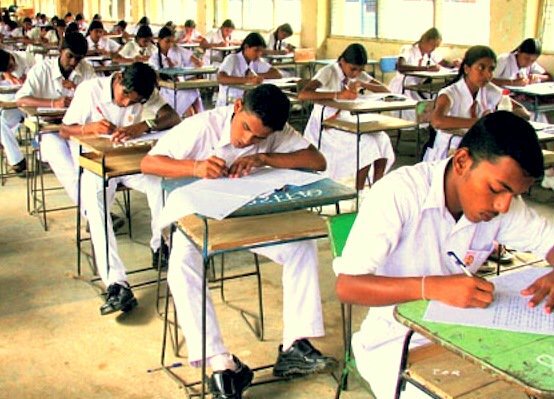 Meanwhile Sri Lanka President Mahinda Rajapakse has requested the Higher Education Minister, S B Dissanayake, to submit a full report on the total number of students who faced inconveniences due to the change of the z-score calculations. President has said that he would be taking a final decision about the issue to ensure no injustice is done for the students. The government will ensure that the students who were inconvenienced by the Z-score will be granted justice, Higher Education Minister S.B. Dissanayake stated last week at a media briefing. He says that the report detailing the implementation of the Z-score results has handed over to the President. 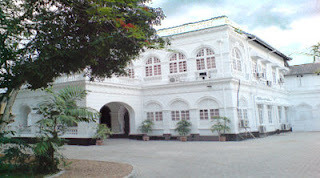 Though the officials have various ideas, there has been widespread condemnation regarding the handling of the Z-score issue with A/L students around the island staging numerous protests and opposition parties demanding justice for students who they claim have been wronged by the government’s inability to handle the situation.